Sleep deprivation can be the underlying cause of numerous health issues, including weight gain, heart disease, high blood pressure, and mood swings. The lack of sleep makes us prone to sickness and increases our risk of serious health problems, including premature death. Most people need between 7 or 8 hours of sleep each night, and chronic sleep deprivation leads to a bad mood, irritability, grogginess, as numerous other side effects, such as stroke, heart disease, and diabetes. 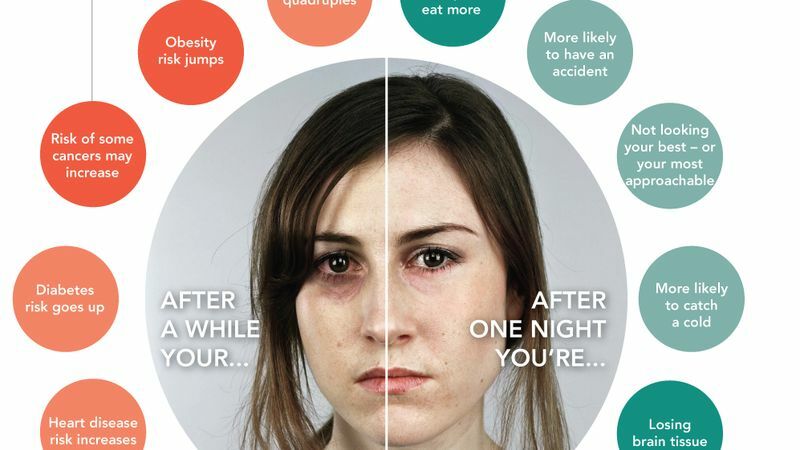 According to NHS, about 1 in 3 adults suffers from the consequences of sleep deprivation. Even though daytime napping can alleviate the symptoms of the lack of sleep, it cannot substitute a good night sleep. 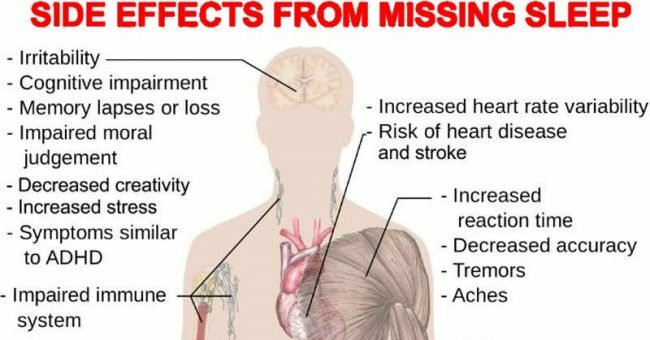 In most cases, sleep deprivation is a result of stress, poor lifestyle choices, anxiety, medications, alcohol, caffeinated drinks, smoking, and sleep disorders. -- Type 2 Diabetes is one of the many adverse effects of sleep deprivation. Little sleep impacts nighttime glucose regulation and predisposes a person to diabetes. -- Sleep deficiency can also cause heart disease, as short sleep or disrupted sleep patterns increase the risk of cardiovascular problems. -- It also causes chronic inflammation, since the body does not have enough time to repair the damage done during the day and recharge. Long- term inflammation can raise the risk of developing chronic diseases like cancer, diabetes, and heart disease. -- Disrupted sleep pattern impact the production of hormones, such as thyroid hormones, melatonin, cortisol, growth hormones, and hunger hormones. -- Sleep deprivation causes depression and mood swings, as it affects hormone levels and causes depressive thoughts and behavioral changes. During REM sleep, our body secretes serotonin, and its lack is linked to depression. -- Sleep deprivation and chronic exhaustion can make one make fatal mistakes that can even cost someone’s life. For instance, a loss of sleep can make drowsy drivers cause serious car accidents since it impairs judgment and reaction time. Deep, slow, self-aware breathing is an ancient and powerful way to relieve stress and tension, and relax in order to prepare your body and mind for a nightly transition to sleep. It stimulates a series of physiological changes that help relaxation, including lowering muscle tension, metabolism, and blood pressure, and slowing breathing rate and heart rate. You can also try some structured breathing exercises, such as the popular “4-7-8” breathing. Lie in a comfortable position, with the eyes open or closed, as you prefer. Then, inhale for four seconds, and hold the breath for seven seconds. Again, exhale slowly for eight seconds, and repeat the entire procedure several times. You will increase the oxygen levels in the body by inhaling deeply and holding your breath, so you will allow it to work less hard. On the other hand, the long and slow exhale has a meditative property that is inherently relaxing. It is also very similar to the pace of breathing the body adopts while you’re falling asleep. Therefore, deep breathing before bedtime actually imitates the breathing patterns of sleep onset and makes the body and mind ready to enter an all-important period of rest. You will also benefit a lot from guided imagery, biofeedback, autogenic training, and progressive relaxation.